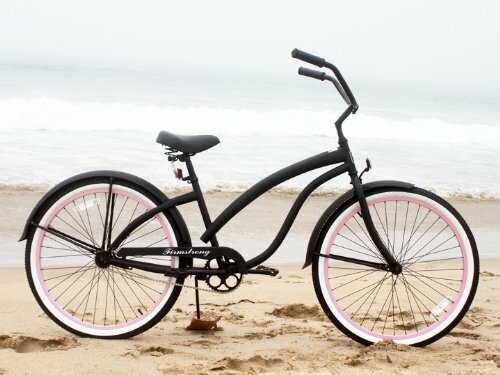 Cruiser bikes are great for riding along the beach and pack enough style to turn heads. 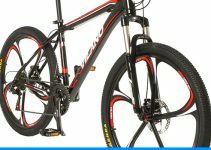 When compared with standard mountain bikes, cruisers tend to cost less and offer a much more comfortable ride. Beach cruiser bikes stand out from the crowd, and although they’re not made for racing down a mountain trial, they offer plenty of comfort. The sight of a cruiser parked against a wall should make you think of California beaches, warm breezes and beautiful blue skies. With sturdy upright frames and extra-wide tires, cruiser bikes are designed for style and ride quality. They’ll let you enjoy the scenery and have a great time. Many cyclists use a cruiser to commute, and with big balloon tires, it’s one of the best bikes for the job. The level of stability that you get from this type of bike is unmatched. A cruiser isn’t the fastest form of transportation, but it’s not meant to be. As the name would imply, cruiser bikes are designed to let you cruise. Most of these bikes have several common features, which deliver a comfortable, leisurely ride. Since they’re made for stability, cruiser bikes tend to have a heavy steel frame. The tires are also wider because a wider design prevents them from going flat. Due to the design, a cruiser is naturally a great choice for riding on the beach. The only problem is the vast selection of products to choose from. Below, you’ll find reviews for 10 of the best cruiser bikes available. Here’s a top model from Huffy. It comes equipped with a classic cruiser frame and rear rack. For maximum comfort, it comes with a special comfort package, which includes a padding spring seat. The seat is accented with gorgeous embroidery and adds to the overall style of the bike. With dual density grips, this cruiser is designed for maximum convenience, and the pedals are even made for comfort. Cruiser bikes are created for the experience. The retro style will look good on any beach, but it’s also a great choice for commuting. This bike doesn’t have any gears, so it could be a great choice for exercise. It’s a great choice for men, and it’s made by one of the most well-known brands for bikes. Coaster brakes make it easy to stop, and the Crème tires look good while delivering plenty of stability. The 40mm tan alloy rims are also built for stability, and they complement every other feature. Here’s a top pick for women. 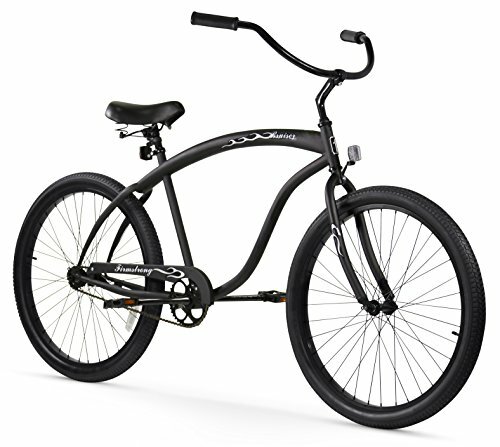 It features a classic cruiser frame and has a stylish paint job. It serves as a comfortable, sturdy ride, and it’s made by Huffy. The Good Vibrations cruiser has a comfortable saddle, which combines dense padding and strong springs. To complete the look, the saddle has been equipped with a number of stylish details. The bike has double density grips and pedals, and these components are made to give you a comfortable ride. The fenders are sturdy and feature a classic style, but they’re also good at protecting your clothes from moisture. 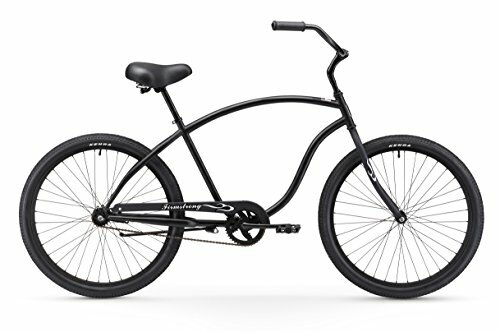 The Good Vibrations cruiser comes with coaster brakes, which are easy to use and reliable. Like other cruisers made by Huffy, this women’s bike is made for fun. It uses Huffy’s CruzFit geometry to increase comfort and provide a better fit. The dense, embroidered spring saddle feels good under your bottom and can make every ride more enjoyable. This is a top product for men. Before making a purchase, you can choose from three different gear settings. For basic riding, consider the one-speed gearing. If you’re not a big fan of physical exercise, consider getting the seven-speed gearing. The Firmstrong Chief cruiser is available in six different colors and has an elongated frame. The unique shape of the frame is ideal for tall riders. This bike is designed for forward pedaling and keeps the seat much closer to the ground. The overall design of the Firmstrong Chief is also great for proper leg extension. It has a 21.5-inch steel frame, which has a circular, high-arching tube design. The 26-inch wheels are made of aluminum and designed for strength. The wide balloon tires offer a cushioned ride, and they’re great for cruising along the beach. The Firmstrong Chief has coaster brakes, which are very easy to use. This cruiser is made for taller men and supports proper arm and leg extensions. The Firmstrong Bruiser is a 26-inch, single-speed cruiser. It’s designed for relaxed, easy riding. For a beefier appearance, it has a thick top tube design. The extended steel frame is 19 inches and creates a large space between the handlebars and rider. It has a set of balloon tires, which feature an extra-wide design. The Firmstrong Bruiser is equipped with coaster brakes, so it’s an easy bike to bring to a stop. An oversized seat is designed to keep your rear comfortable while delivering an exceptional riding experience. The seat has dual springs, and the handlebars are fitted with synthetic leather grips. This cruiser is designed for men, and it could be an especially great choice for taller men. If you’re looking for a popular recreational cruiser, the Firmstrong Bruiser is worth considering. The Firmstrong Bella is made to cruise along the beach. It’s available in 15 different colors, and you can even choose from a handful of different speeds. This three-speed cruiser is designed for casual rides and can give you plenty of exercise. 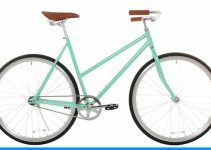 It’s a popular choice for women and features convenient coaster brakes. To activate the brakes, all that you need to do is pedal backwards. The Firmstrong Bella has 26-inch wheels and can fit most women. The bike is made to keep the rider at a comfortable opened position. For easy shifting, this bike is equipped with Shimano internal gear technology. 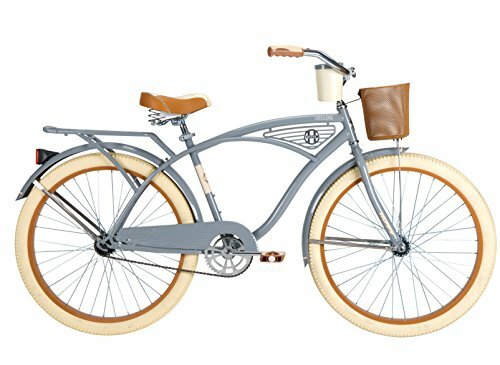 The Bella continues to be one of the best-selling bikes for women because it’s very easy to use. The gearing uses a Shimano Nexus 3 internal hub, and it’s suitable for tackling hulls and long rides. 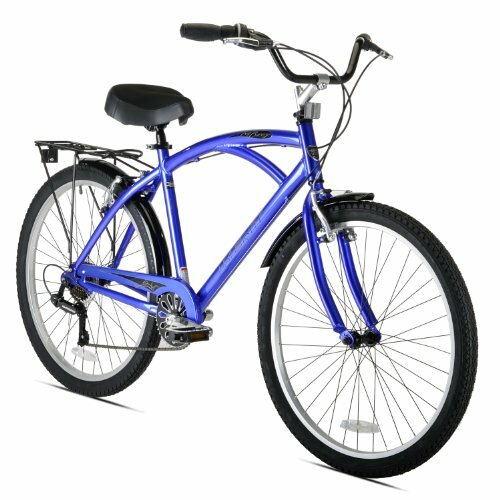 You shouldn’t have any trouble using this bike on the beach or around town, and it’s made for cruising and exercise. If you’re a man, consider this Sixthreezero cruiser bicycle. It’s a 26-inch, single-speed cruiser, but you can also choose from three and seven-speed versions. 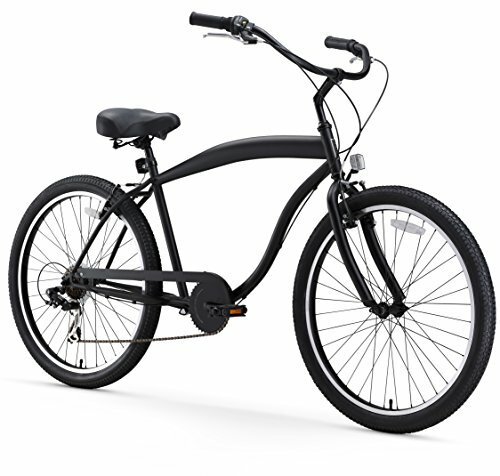 It has an extended 18-inch steel frame and features a forward-pedaling design. With a low-profile design and blacked-out components, this could be a great bike for most men. The spokes are also blacked out, and the bike has an embossed comfort bubble saddle. It has a matching grip and rubber comfort pedals. Like other cruisers, all of the features on this bike are made for comfort and control. The Barrel is a bike that aims to capture the same level of excitement that a surfer gets while moving through the barrel of a huge wave. It offers superior comfort and can be used for a long ride with friends. With a maximum cruising speed of 15 miles per hour, this bike is ideal for almost any environment. The Kent Bay men’s cruiser is made with a strong aluminum frame and features seven-speed Shimano gearing. It has twist shifters for easier shifting, and the rear bike rack is perfect for carrying your belongings. Front and rear fenders deliver great protection, and the linear pull brakes allow you to stop on a dime. Although this Kent Bay cruiser features a classic design, it offers modern functionality and doesn’t compromise safety. The lightweight aluminum frame is sturdy and reliable. You can use this bike to ride on a variety of surfaces. It’s great for trails, paths and unpaved roads. With a stylish look, it can help you to turn heads while delivering an enjoyable cruising experience. The comfortable saddle improves the ride quality and enhances stability. You can even adjust the saddle height, which makes it possible to get a customized fit. Here is a popular choice for young girls. It features a strong steel frame and 16-inch wheels. It has a stylish classic cruiser tank top tube design. For easier dismounting, it has an extra stand over height. Two high-quality fenders protect against grime and puddles, and a chain guard protects your clothes from getting ruined. It’s quite common for little girls to be scared of their first time riding a bike. This mini Della Cruz is designed to make the experience fun and enjoyable. It has little accents and offers a variety of features that are great for young girls. If you’re looking for a top cruiser for your young girls, this could be a great choice. 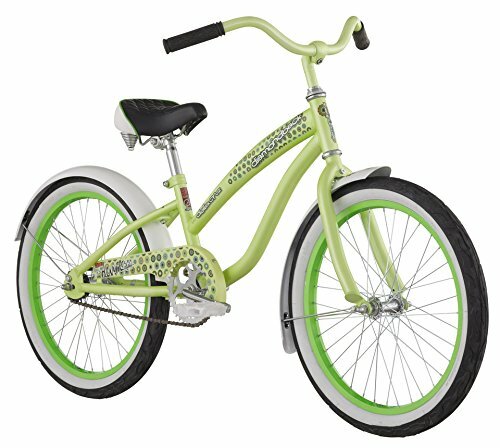 It has many of the features that result in a great cruiser bicycle and offers a paint job that most little girls will love. 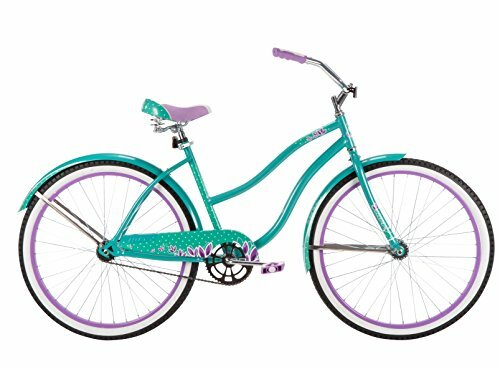 If you’re shopping for a high-quality cruiser for women, the Schwinn Perla could be a great choice. Due to the surfaces they’re likely to travel, it’s important for a cruiser bicycle to have a sturdy frame. 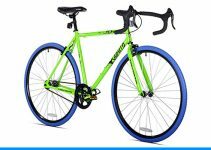 Since this bike has a durable steel frame, it meets the criteria. When combined, the frame and fork provide a very comfortable riding position. The Schwinn Perla is made with seven-speed twist shifters and features a Schwinn rear derailleur. These components deliver the quickest shifts and make it easier to ride on any surface. Alloy V brakes let you stop quickly and avoid serious injuries. The seat is made of high-quality padding and uses springs to soften the ride. With full fenders, this bike can be enjoyable to ride in any weather. 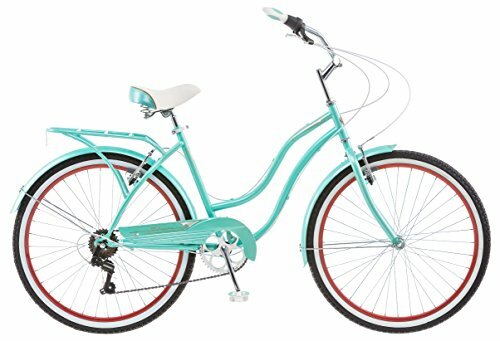 The Schwinn Perla is made with a classic frame style and has matching fenders. You can use the seven different gears to leisurely cruise up hills, and the handlebars keep your body in a comfortable, upright position. This bike even comes with a lifetime warranty. 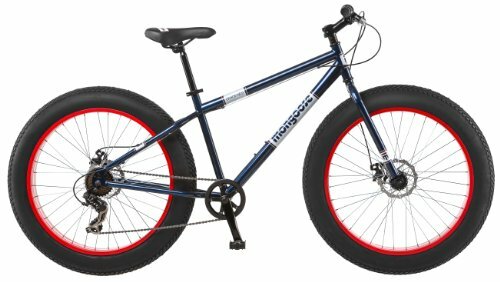 The Mongoose Men’s Dolomite cruiser bike doesn’t look like your everyday cruiser. Its massive knobby tires have a width of four inches, which is especially useful for riding on or along the beach. The supersized tires make this bike extremely noticeable, so it’s a great bike to ride when you want to have conversations with strangers. The cruiser design offers plenty of clearance and can be used to conquer almost any terrain. The four-inch wheels are equipped with disc brakes and don’t require much effort to stop. With a seven-speed Shimano gearing system, the Mongoose Dolomite cruiser is not a strenuous bike to ride. It has a three-piece crank and features beach cruiser pedals. With such large tires, this bike almost looks more like a dirt bike than a cruiser. You can use this product to cruise over snow, dirt and sand, and the thick tires are bouncy enough to absorb shock energy. There aren’t too many other bikes that have fat tires like this one. Regardless of your budget, there is sure to be a high-quality cruiser that fits your lifestyle. This type of bicycle is all about taking it slow. When you’re not in a hurry to get to your destination, a cruiser is an excellent form of transportation. They’re designed for comfort, control and stability, which is why they’re ideal for almost any surface. Whether you’d like to conquer snow, dirt or sand, the best cruiser bicycle can help you get it done.